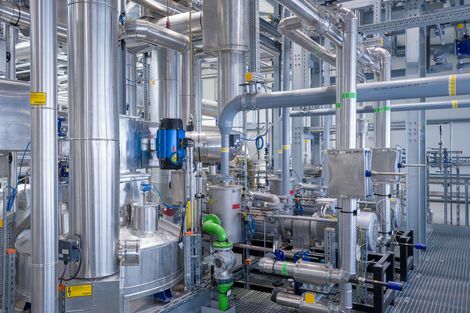 At this facility, from November 2018 onwards, with its innovative newcycling process, APK AG in Merseburg will transform 8,000 tonnes of plastic waste into polyethylene and polyamide to a level of quality which is practically as good as new. Newcycling is the name of the process that makes use of the material cycles. In this con-text, the solvent is purified and reused in a continuous cycle, explains Florian Riedl. APK's Head of Business Development for Newcycling continues: "The regranulate from the newcycling process can be reused in sophisticated applications, such as flexible packaging, and in this way, replace newly manufactured plastics." Conserving resources through materials recycling. APK has not yet received the ultimate accolade of approval for the food industry. Yet the demand from the world of industry for high quality granules is exceptionally high at both the domestic and international levels. For Mersalen (LDPE), brand owners and packaging manufacturers are the key customers. The firm wraps detergents and cleaning products, for example. "As very few LDPE regranulates are currently used in flexible packaging, we are tapping into a new market," explains Florian Riedl. Mersamid (PA) mainly sees use in technical applications. Household waste would pose a particular challenge, explains Florian Riedl, as it mostly tends to be highly mixed. A type-pure separation of the differing types of plastic with the use of modern sorting facilities isn’t economical. In this respect, the small-format films of various types of plastic are combined to create a mixed residual fraction. To date, mixtures of this kind have usually ended up at waste incineration plants, or are processed into regranulates which can only be used for low-quality applications such as park benches. "With the newcycling process, it is even possible for these mixed fractions to be reconditioned to a high quality," explains Florian Riedl, describing the level of quality that the Merseburg-based business is able to offer. The plans for expansion don’t just have a firm footing due to the statutory requirements, however: the market for higher quality regranulates is also growing all the time. Both brand owners and packaging manufacturers have set themselves the target of massively increasing their proportions of regranulate. So that they can achieve this, above all else, high-quality regranulates are required, explains Florian Riedl. Therefore, innovative recycling methods are necessary which can produce high-quality products from inferior waste streams – such as newcycling from Central Germany. When it attended the Fakuma trade fair at the joint stand for Saxony-Anhalt last year, newcycling proved able to convince suppliers and customers that it keeps what its developers promise. From 16 until 22 October, APK AG will again be attending this leading international trade fair for plastics processing in Friedrichshafen, where it can be found at the stand for Saxony-Anhalt, FO-38.